The SMART Centre works with local Sanitation entrepreneurs in increasing the availability of low-cost Sanitation technologies. Some of the technologies are cement pedastools, no-cement latrines (corbelled latrine), cement slabs and a range of compost toilets. One of the most successful products is the slab with the ‘flapper’ or SaTo Pan (http://www.sato.lixil.com/). 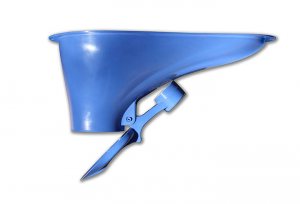 This is a plastic element which can be fitted into an existing latrine, into a pedastool or into a new (cement) slab. The flapper closes of the latrine and prevents smells and flies, thereby greatly improving the hygiene.